The large displacement motorcycles becoming more and more powerful in the Indian two-wheeler market, whereas, the some others are making their best efforts to approach this segment in the country. India is one of the largest two-wheeler markets for the manufacturers that carry a wide range of motorcycles which have engines ranging from 100 to 1500 CC. Recently, the Honda Motor has introduced its most anticipated motorcycle in the domestic market, Honda CBR 650R, while some large engined motorcycles are also in the queue of their launching. 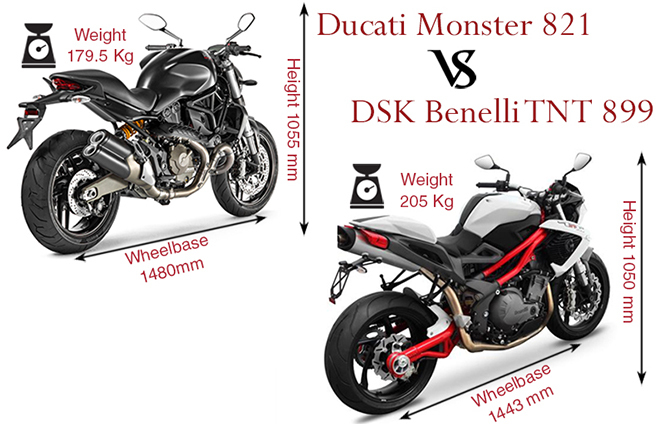 Here, we are going to take a round on the two most famous motorcycles, Benelli TNT 899 VS Ducati Monster 821, that have received a lot of attention from the audience. The Ducati Monster 821 is one of the most popular middleweight motorcycles in this category that is known by its bulkier look. The motorcycle is featured with a bulky fuel-tank, red-colored visible chassis, tapered headlight and compact front mudguard that gives a robust look to the motorcycle. The two-in-to-one exhaust, solo seat and wide handlebar are the outstanding key features that bring you unprecedented riding pleasure. The Benelli TNT 899 is the most fabulous motorcycle from the Benelli stable that worn some unique elements that make it more pretty sporty. A bug's eye shaped headlight, bulky fuel tank, carbon solo seat tail, visible frame and side fairing are contributed to add more beauty in the style. The TNT 899 is even more appealing with it's under seat exhaust, rear-mounted foot pegs, and front & rear carbon mudguards. The Monster 821 is featured with a fully digital LCD panel that carries information of speedometer, odometer, trip meters, tachometer, ABS and DTC modes, gear position, clock and much more. Whereas, on the other side, the Benelli TNT 899 sports a semi-digital instrument console that is featured with speedometer, odometer, tachometer, trip meter, clock and fuel gauge. In terms of performance, both the street fighters have so much potential such as the Benelli TNT 899 is powered by the inline three cylinders, four-stroke and liquid cooled motor, carrying an engine displacement of 898cc, the motor is programmed with an electronic fuel injection system that are contributed to return 118 BHP of power at 9500 RPM and 88 Nm of torque at 8000 RPM. The motor is paired with six-speed transmission that helps to touch maximum speed of 200 KMPH. 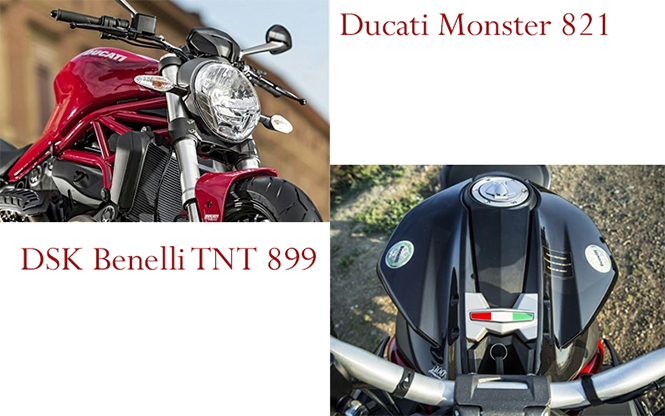 The Monster 821 comes powered with a robust Testastretta 11degree 821cc L-twin and liquid-cooled motor. Thus, the air injection system engine combines to deliver 112 BHP of power at 9,250 RPM and 89.4 NM of torque at 7,750 RPM. The engine is mated to a six-speed transmission with APTC slipper and self-servo wet multiplate clutch with control cable. The Monster 821 is the most versatile machine which does not only provides dynamic riding performance, but also takes care of the fuel consumption. 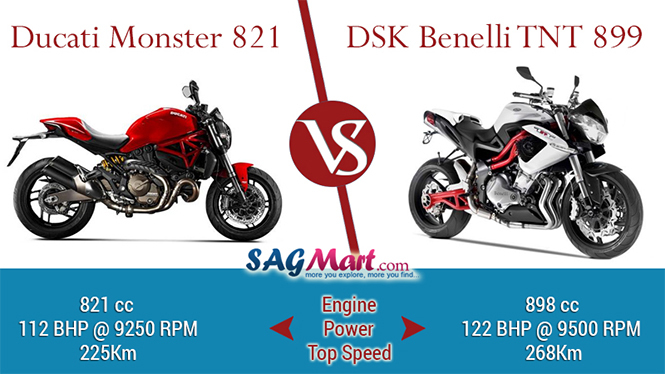 The Ducati Monster 821 has the top speed of 200 KMPH. 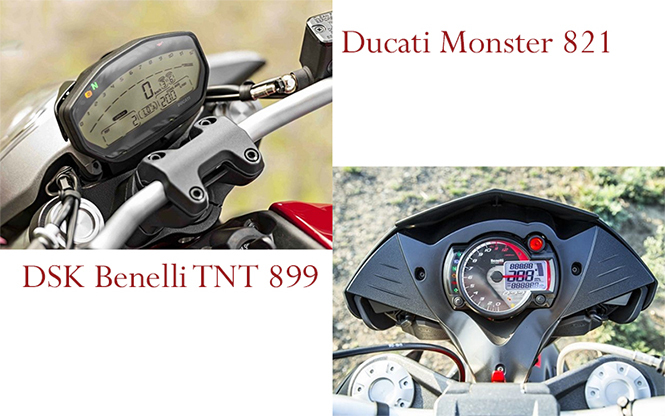 If talking about the safety components, the Ducati Monster 821 uses several safety components than the Benelli TNT 899. The Monster 821 is featured with standard components to make the ride dynamic as well as enjoyable. The Monster 821 is built around on a tubular steel trellis frame that provides excellent stability at the corners. The Benelli TNT 899 is manufactured on a trestle steel and aluminum alloy caste frame that are sited well on front Marzocchi 50mm upside down forks and Sachs shock 120mm stroke with adjustable preload rebound suspension. The motorcycle uses Twin 320 mm floating discs with radial mounted Brembo 4 piston calipers at front and single 240 mm wave disc with Brembo twin piston caliper at the rear. Both the motorcycles have excellent ergonomics, thanks to the power-to-weight-ration that helps to enhance the riding experience. Moreover, the Benelli TNT 899 has kerb weight of 231 KG and it measures 2100 mm in length, 790 mm of width and 1050 mm in height. 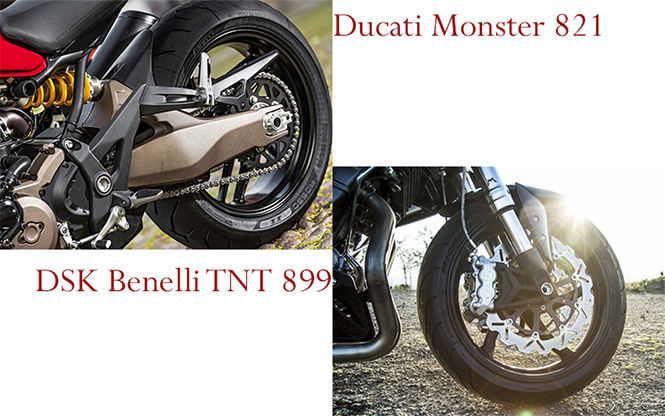 The ground clearance of the TNT 899 is 130mm that make it able to ride it on any type of road conditions. The Ducati Monster 821 is featured with adjustable seat height (785-810 mm) which allows the rider to change according to their need. The motorcycle weighs kerb weight of 205 KG, thanks to the manufacturer for using fiber elements to reduce the weight of the motorcycle. 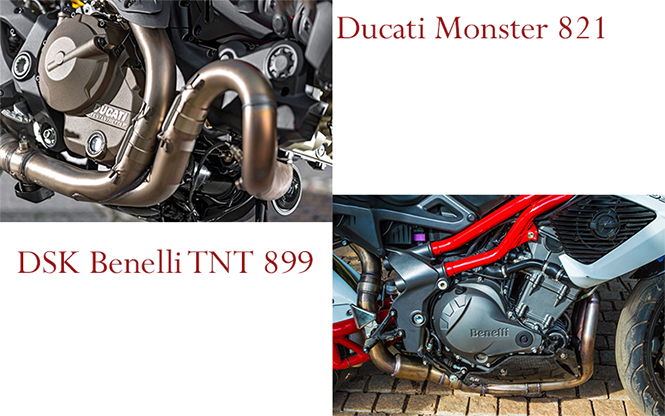 The weight of Monster 821 is lower than the Benelli TNT 899. It is featured with broad tyres that provides excellent stability and rigidity at any type of road conditions. With the excellent ergonomics, the motorcycle consists of 2170 mm of length, 800 mm of width and 1055 mm of height, whereas the wheelbase is 1480 mm. Everything is pretty much excellent about the both the middleweight motorcycles, whether it is style and look or performance. In terms of price, there are not much different in the both motorcycles as the Ducati Monster 821 is available in the domestic market at Rs. 9,45,000, while the Benelli TNT 899 is being sold in the country at Rs. 9,75,000.